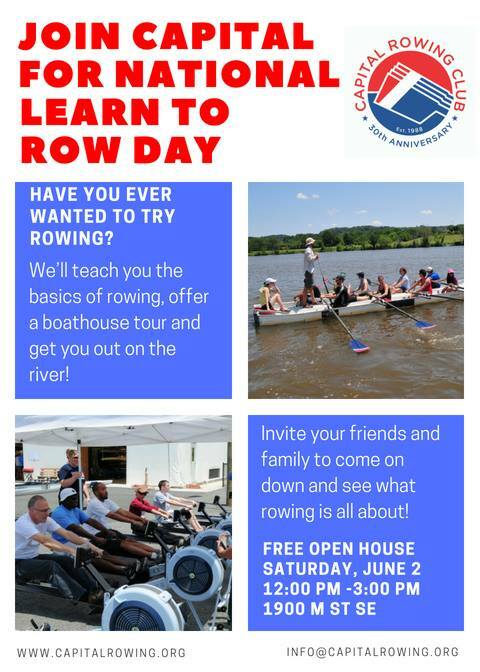 The 17th annual National Learn to Row Day, sponsored by USRowing and Concept2, will be held on Saturday, June 2, 2018. Competitive and recreational rowers range in age from 12 to over 90, so it is never too early or too late to take up the sport. Capital Rowing Club, located at the Anacostia Community Boathouse in Southeast DC, is the home of community rowing in the nation’s capital. Over 350 rowers of all ages, incomes, and physical abilities participate in 11 programs, including ones for middle and high school students and for adaptive athletes. Whatever your schedule or goals, we have a program for you! Come down to the boathouse at 1900 M Street SE on June 2 from Noon to 3 PM and find out what rowing is all about!